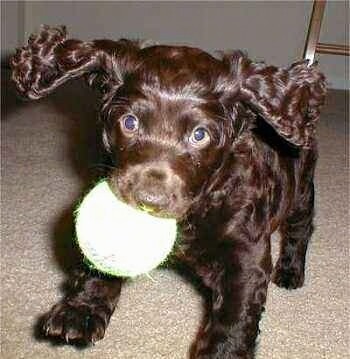 The Boykin Spaniel has a Spaniel type head. The tail is docked. The waterproof coat is rather wavy or curly, but a smooth coat is acceptable (hunters care more about the dog’s hunting abilities than its coat type). Color is liver or brown. 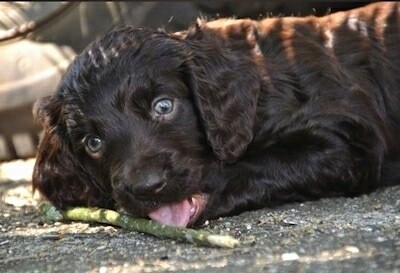 The Boykin is larger than the Cocker Spaniel, with smaller, higher set ears that are covered with long, wavy hair. He has considerably less hair and a straighter muzzle. 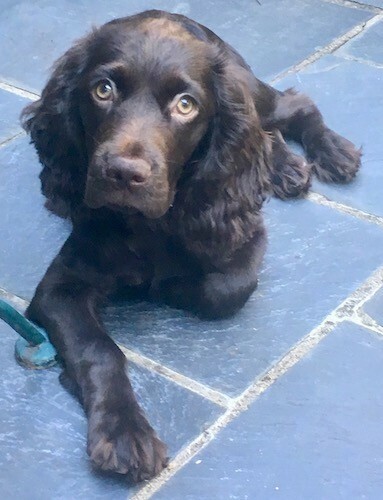 Docile, pleasant and obedient, an intelligent and loyal companion, Its trademark yellow/amber eyes that stare expectantly into your eyes are often commented upon as if the dog is asking, “What do you want me to do next?” The Boykin Spaniel is a fantastic swimmer. They enjoy water and swimming; however they are prone to Spaniel ear infections and should be dried well after getting wet. Most owners report that each of these dogs has a unique personality and an enthusiastic field ability seldom matched by other dogs. His fine nose and enthusiasm in the field make him a versatile hunter. 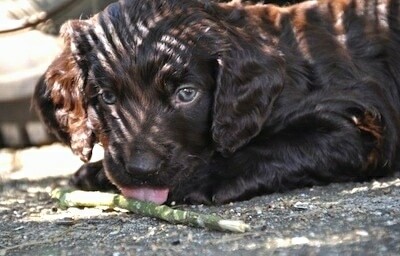 They have been bred as hunting Spaniels and have exceptionally good noses. Their sense of smell can lead them on an excursion if allowed to roam off-lead. This dog needs an owner who displays natural leadership consistently communicating with the dog what is expected of him and what is not. The most common health issues are hip dysplasia, eye problems such as cataracts, and a few localized lines have heart and skin problems. Prone to ear infections. The Boykin Spaniel will do okay in an apartment if it is adequately exercised. A small yard is sufficient. 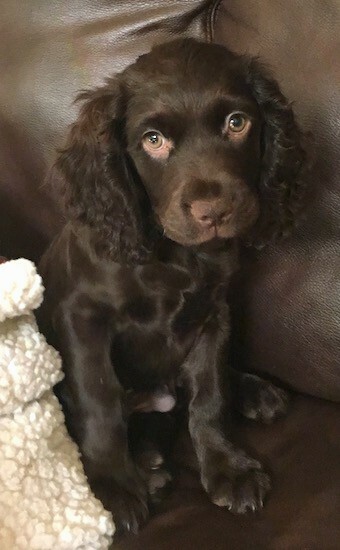 The Boykin Spaniel is a working dog and needs a lot of daily exercise, including a long, brisk daily walk, where the dog is heeling beside or behind you; never in front, as in a dog’s mind, pack leader goes first. They have a high drive and are very willing. This is an intensely energetic dog that needs adequate exercise and a “job” to do daily to burn off energy and exercise its very nimble mind. They will find ways to entertain themselves if not provided by their owner and can be very destructive when bored or when their primal instinct to walk has not been fulfilled. Requires brushing every few days to avoid coat matting. This breed is an average shedder. Just after the turn of the 20th century, Alexander White of Spartanburg, South Carolina, saw a small brown Spaniel-type dog wandering around after church service. The dog appeared to be a stray and he decided to take the dog home with him. He discovered that the dog had great hunting abilities. This stray had a wonderful bird sense. Alexander gave the dog to his hunting partner L. Whitaker Boykin. The dog was a male and he was given the name "Dumpy." 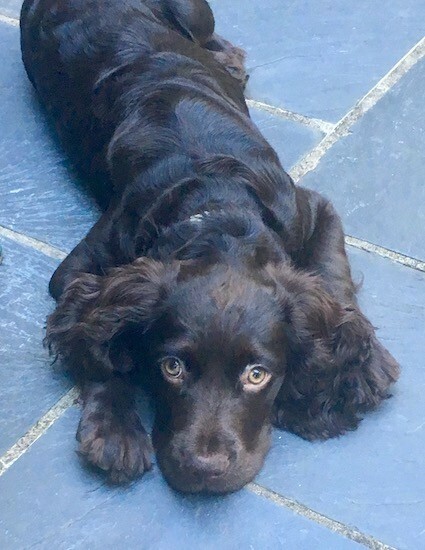 The Boykin Spaniel breed has evolved from this one dog, with crosses to American Water Spaniels, Springer Spaniels, Pointers and Chesapeake Bay Retrievers. It is used as a hardy retriever of upland birds as well as water fowl. 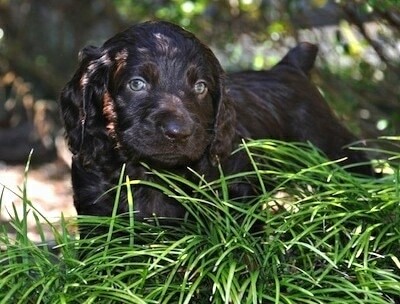 The Boykin Spaniel is popular in the southern United States among bird hunters. 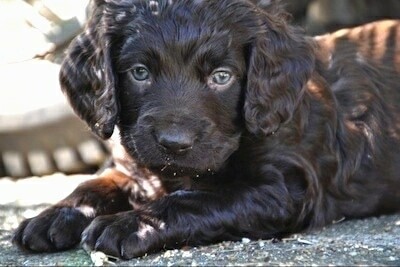 Its state of origin is South Carolina, USA, which has designated the Boykin Spaniel its official state dog. 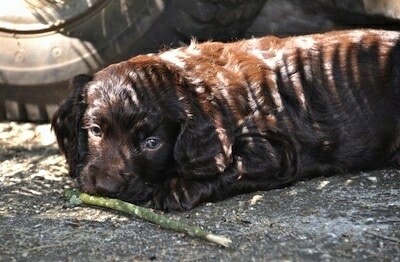 In July 2005 the Boykin Spaniel Club of Breeders Assoc. of America was named by AKC as the official parent club. 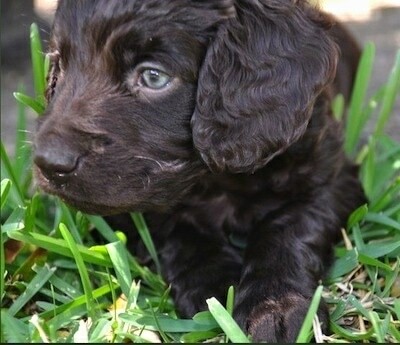 The Boykin Spaniel was an AKC FSS (Foundation Stock Service) breed for many years. The BSCBAA submitted their paperwork to AKC to progress into the miscellaneous group and was approved on February 9, 2007 with the effective date of January 1, 2008. Breeders hope to move the breed from the AKC miscellaneous class to the sporting group sometime in the future. 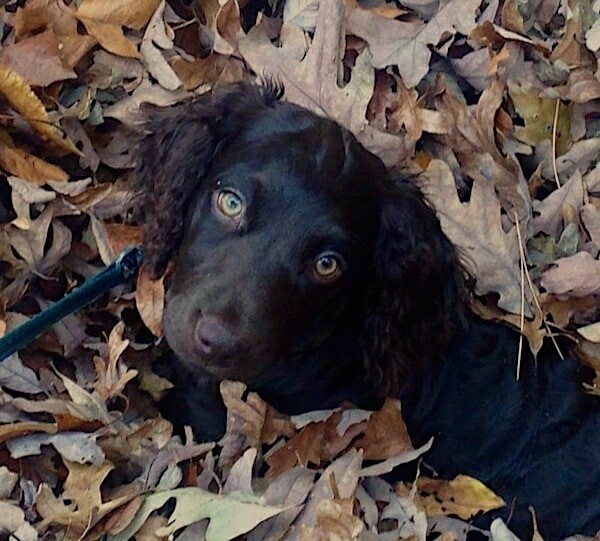 NAPR = North American Purebred Registry, Inc.
Daisy the Boykin Spaniel as a puppy at 16 weeks old—"Daisy loves these leaves. She jumps in the pile until she completely disappears, then jumps out & looks at us like she's saying, "What?" High energy... we walk a minimum of 2 miles every morning rain or shine, chases her ball until I'm tired of throwing it, then another mile plus in the afternoon. Affectionate, mischievous and active, she certainly keeps us both busy!" 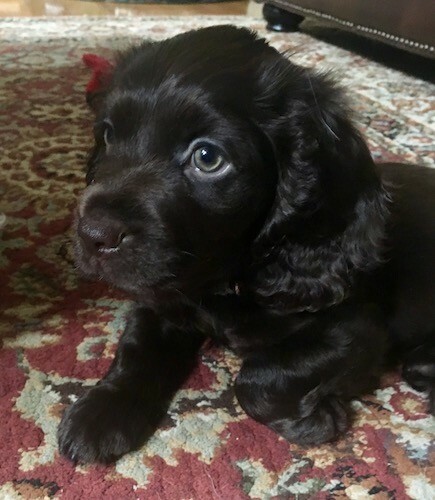 "Ollie is a Boykin Spaniel puppy and he is around 5 weeks old here. Playing in the Monkey Grass is one of his favorite things to do during playtime. Everything is an adventure for Ollie at this age and everything is a toy. He loves to chew on anything he can get his teeth into. His eyes are finally turning from baby blue to the golden color they were intended to be." 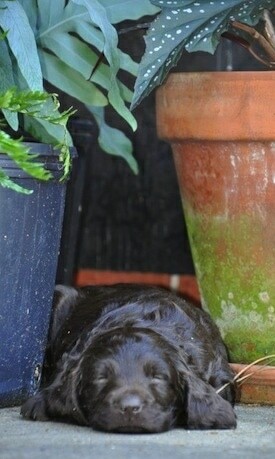 Ollie the Boykin Spaniel puppy at 5 weeks old sleeping next to the flower pots. Abi as a puppy playing with her toy ball. 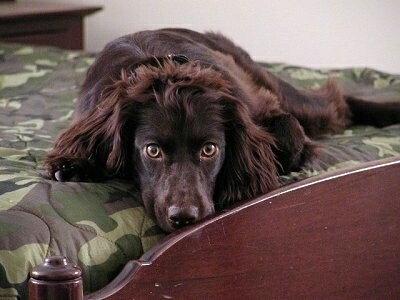 Sadie the adult Boykin Spaniel sleeping on the bed.